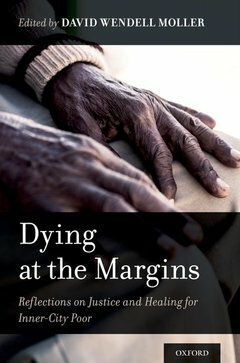 Dying at the Margins: Reflections on Justice and Healing for Inner-City Poor gives voice to the most vulnerable and disempowered population-the urban dying poor- and connects them to the voices of leaders in end-of-life-care. Chapters written by these experts in the field discuss the issues that challenge patients and their loved ones, as well as offering insights into how to improve the quality of their lives. In an illuminating and timely follow up to Dancing with Broken Bones, all discussions revolve around the actual experiences of the patients previously documented, encouraging a greater understanding about the needs of the dying poor, advocating for them, and developing best practices in caring. Demystifying stereotypes that surround poverty, Moller illuminates how faith, remarkable optimism, and an unassailable spirit provide strength and courage to the dying poor.Dying at the Margins serves as a rallying call for not only end-of-life professionals, but compassionate individuals everywhere, to understand and respond to the needs of the especially vulnerable, yet inspiring, people who comprise the world of the inner city dying poor. David Wendell Moller is the Director of Health Care Ethics at Anne Arundel Medical Center in Annapolis, Maryland. He is the author of Dancing with Broken Bones: Poverty, Race, and Spirit-filled Dying in the Inner City.